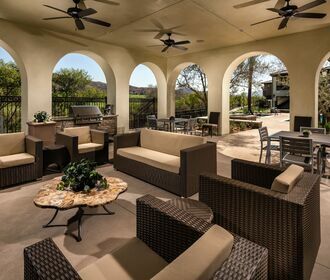 Imagine your home is a private retreat in a serene setting, but steps beyond this oasis, you’re surrounded by buzzing activity and lively entertainment—gorgeous canyon hikes, trendy shops and restaurants, theaters and golf courses. 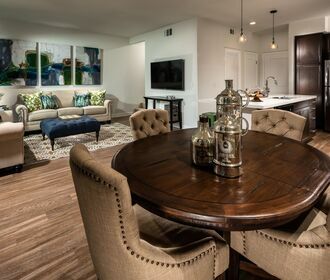 This appealing home can be yours when you rent an apartment at Encanto at Dos Lagos. With spacious one and two bedroom floor plans available in five styles, you’re sure to discover a model that enchants you. Inside every home, the clean lines of pristine surfaces greet you, including hardwood-style floors throughout the common areas and quartz counters topping the kitchen and bathrooms. The chef-worthy kitchen, adorned with stylish cabinets, is fully equipped with a gas stove, refrigerator with a built-in icemaker, microwave and dishwasher for your convenience. Other features that will simplify daily tasks include an in-home washer and dryer set, as well as walk-in closets in select homes. 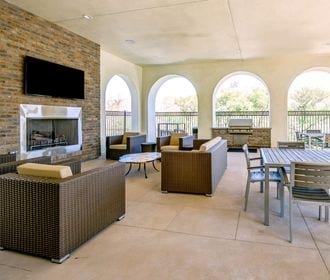 Outside, discover the benefits available to residents at Encanto at Dos Lagos. Home feels like a five-star resort when you’re lounging under cabanas or taking a dip in the saltwater pool. The on-site fitness center offers twenty-four-hour access, making your goals more attainable than ever. Discover luxury living in Corona, CA. Call today.